We built a home this year and moved in 6 months ago. During the construction process, I did a lot of research on the materials that were being used to build our home and the toxins they release. Needless to say, YIKES! I knew that the paint would have a low VOC level but I was mostly concerned with the carpet fibers, carpet glue, etc. But I quickly found that there was more to it. The lumber used to build our home was pressure treated with agents which contain formaldehyde. Luckily, I found that after about 90 days the lumber no longer releases those toxins. But what to do in the mean time? Well, who would have thought that there was such a simple, affordable solution….house plants! 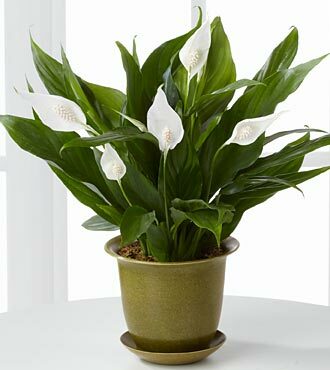 I found that Peace Lilies (from the Spathiphyllum genus) clean indoor air of all sorts of toxins, including benzene and formaldehyde. We didn’t have them the first weekend we moved in and we both developed sore throats and headaches. So I went out and purchased a Peace Lily and an Angel Plant (from the same genus). I only spent around $50 on the plants, soil, pots, etc. and as soon as I brought the plants in, they IMMEDIATELY helped! Plus, these particular plants don’t require a lot of water or light to survive, which is great since I’m so new at this.